This is my first ever Nintendo DS game. Before I even get into my review spiel, I will tell you that I am very pleased with my purchase and even more pleased about how this game is still popular even a year and some after its release. Mario Kart DS encompasses everything I love about the Mario Kart series and puts it into one game. Mario Kart DS includes tons of race tracks from Super Mario Kart, Mario Kart 64, Mario Kart: Double Dash, and Mario Kart: Super Circuit. They aren't just re-made as race tracks in this game either, they are used as battle courses, and more importantly, missions. 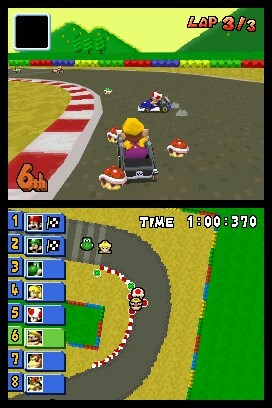 Mario Kart DS doesn't only borrow these great tracks from the other games, but it also includes features like in Double Dash, including power slide speed bursts and some of the items from the previous games as well. Another new feature only found in this game is the addition of "Drafting", where you can actually get speed boosts off of other players that are in front of you if you keep on their tail. Like most official Nintendo DS games, they wanted to show off their new technology. One of the most interesting things I found was the balloon battle mode. You actually have to blow up or inflate your own balloons by blowing on the screen. I'm not sure exactly how this technology works, considering it only works if you blow, not if you just talk or anything. It's actually pretty neat. Later I found, alternatively, you may just hold down select to inflate your balloons, but what fun is that? Another show of their ingenuity is the use of the second screen, although most could consider it borderline-cheating, it really is that helpful, especially when you get ink on your screen from the squid item. You can almost navigate completely on the second screen, it shows everything you need, fairly accurately as well, in terms of collision detection. I was kind of worried at first that I might get bored of this game very soon. But with all the modes they packed into this game, you really want to work to get a 100% game cartridge, meaning you want to get triple star ratings on all grand prix and missions to unlock everything in the game. I added the average completion time to this game as 15 hours as a very loose estimate. Some of that time may be spent on trying to get three stars on each cup or missions. I also really love Super Mario Kart, and this game really feels like I am playing my Super Nintendo again, only with better graphics, better features, and better resolution, oh ya, and the two screen thing. There seems to be much dispute in online play. Two terms have been invented with Mario Kart DS: "Snakers" and "Non-Snakers". Snaking is a non-intented (according to Nintendo) game feature that allows a player (who is really fast with buttons) to execute power boosts over and over again even on a straight road by using the R or L buttons. This is seen to many as cheating, these many are usually called "Non-Snakers" and only execute power boosts on corners or turns. Personally, i find it's rather annoying to play against these people since they tend to lag (you see them going all over the place, almost teleporting). That's another thing: the netcode in Mario Kart DS is not the best, some of the collision detection is weird and sometimes I find that others are teleporting around (due to lag). To make matters worse, players have been known to use an overclocked DS to get speed advantages and even cartridge hacks (through rom hacking) to gain other advantages. Overall it is usually good though when you can get a nice group of four people (including yourself), if you see a cheater, you can just leave and try your search again. One thing that has seen great community envolvement is with creating your own emblem in which you get your own 32x32 pixel grid with 15 colors to draw whatever you want. Other players online can see this icon when you join the game, when your ahead of them in-game, and on the front of your car. There is various tutorials on the internet that will show you how to draw things. This isn't the only DS game to feature this kind of thing, many DS games support emblems. As such, sites like Nintendo DS decals & emblems exist. When looking around on the internet at ratings for this game, I had seen that many believe this to be the best Mario Kart ever made with most scores ranging from 90%-100%. People really love this game, and I tend to agree with them. This is a really solid game, and a really great game to add to your NDS lineup.